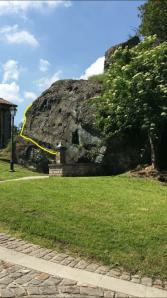 Rocky strip that grows in the historic center of Varana about 4m height. Since it has not been climbed before, the rock is yielding in some places and care must be taken, sticking to the lines avoids any discomfort. 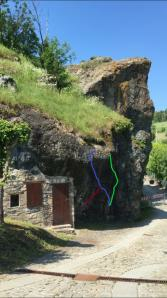 Access: On the main road leading to the rock gym on the left, next to a small building leaning against the wall. Note: It is an exclusively Boulder sector and therefore requires adequate protection. Since it is located in the center of the country requires good behavior, preserve the rock and clean it properly after the climb. There are only four blocks at the moment, three in the first band near the building, one at the left side of the fountain. Type: Same gym rock in the streets, ophiolite. pay attention to what you use for climbing and check before it is safe. 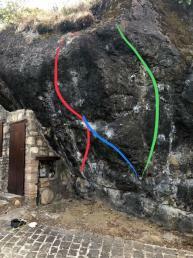 4 La Via del Saggio 6 m 5b+/5c? 5b+/5c?